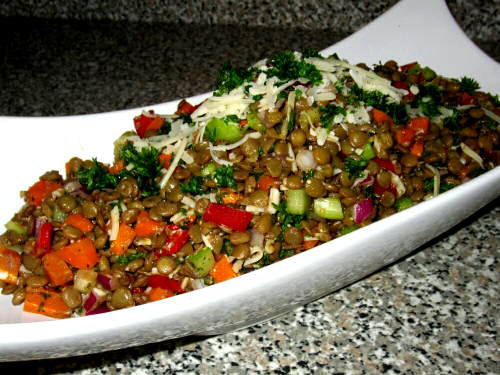 Lentil Salad with Asiago Cheese – Alternative Natural Healthcare Services Inc. Meanwhile, in large bowl, whisk together oil, vinegar, mustard, oregano, salt and pepper. Add lentil mixture, onions, red pepper, celery, cheese and parsley; toss gently to combine. Add a little extra shredded Asiago cheese and chopped parsley on top before serving. Buen apetito and enjoy in good health! *try your best to use organic ingredients as much as possible.